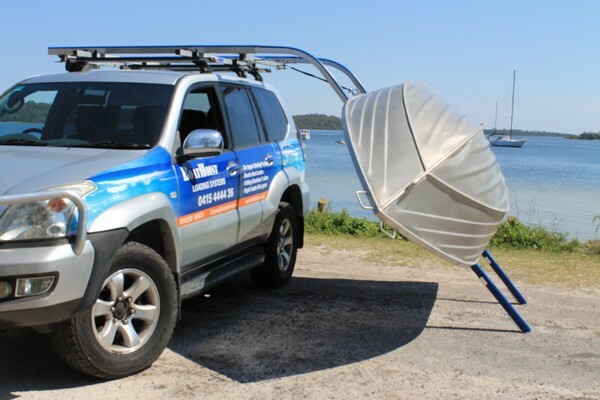 The best boat side boat loader in Australia. One person operation that is safe and easy to use. Fits all caravan tow vehicles. NEW Flexi-Mount System for canopy's on Dual Cab utes. Traditionally all boat loaders had to be fitted onto either the vehicle roof or the canopy, not both as they move separately to each other. BoatHoist have now developed a Flexi-Mount system that absorbs the movement. 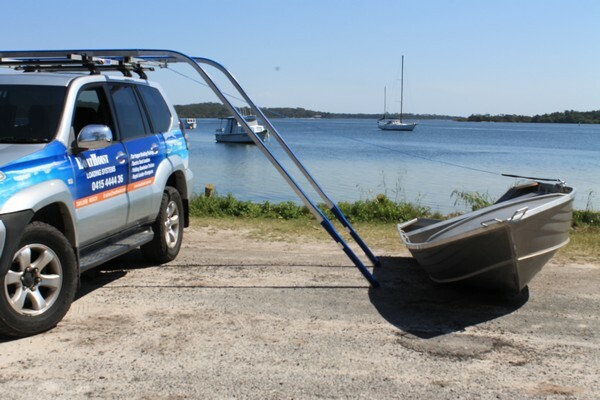 This allows the side boat loader to be connected to both the canopy and the vehicle roof giving you the extra support of a third roof rack. All you need is 3 roof racks of the same height. If your two canopy roof racks are suitable you may not need this option so please phone to discuss before you order the Flexi-Mount option. The BoatHoist SideWinder Boat Loader is a lightweight aluminium side boat loader that is designed to bolt to your heavy duty roof racks. Rated to load up to 130kg the SideWinder boat loading system uses a removable 1.3 tonne 12 volt electric winch with remote control that plugs into your Anderson plug. This roof rack boat loader will fit all vehicle types and can be mounted on wagons, dual cab utes, canopies, builders racks and existing cargo trays. The BoatHoist SideWinder has been designed so that the average home handyman can fit the loader in about 3 hours. Check out our on-line assembly video. Very easy to fit, very easy to use, single person operation. No tie down straps required. We use simple but effective gunnel clamp down plates so your boat will not move. Single person boat loader operation with push button remote. Keep caravan attached to car whilst unloading boat if needed. Easy to remove and store when not in use. Made tough for Australian conditions. No plastic fittings! The SideWinder is supplied direct from our workshop to our customers so you are dealing with the manufacturer NOT a salesman. The SideWinder can be freighted direct to your door in all Australian states or you can collect from our workshops at Taylors Beach Port Stephens NSW or Sunshine Coast, Qld on your way through (give us a call first please). We also offer a fitting service at our workshops (charges apply). CHECK OUT THE CAR GALLERY IN THE BLUE SECTION AT THE TOP OF THIS PAGE! Note: Total roof top load should not exceed vehicle and roof rack manufacturers specifications. 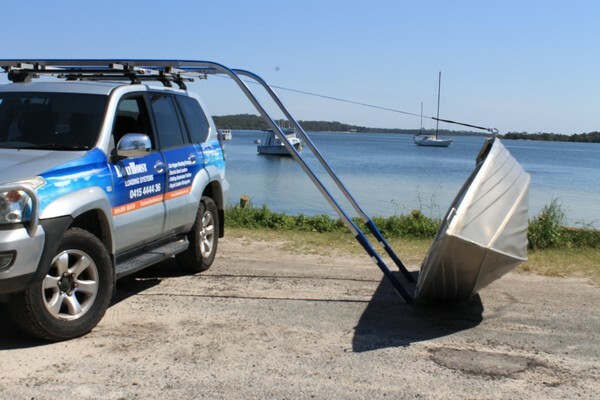 SIDEWINDER BOAT LOADER IS THE BEST BOAT LOADING SYSTEM IN AUSTRALIA. Go on, take the tinnie with you! Does the SideWinder attach to my roof or do I need roof racks? The SideWinder is designed to bolt to your existing heavy duty roof racks. What type of roof racks and how many do I need? What are roof racks rated to carry? Most heavy duty roof racks are rated to 100kg for a set of 2 roof racks. A third roof rack generally increases the capacity to 150kg. Always check the vehicle manufactures rated roof carrying capacity. Will the SideWinder fit onto a dual cab ute with a canopy? Yes. 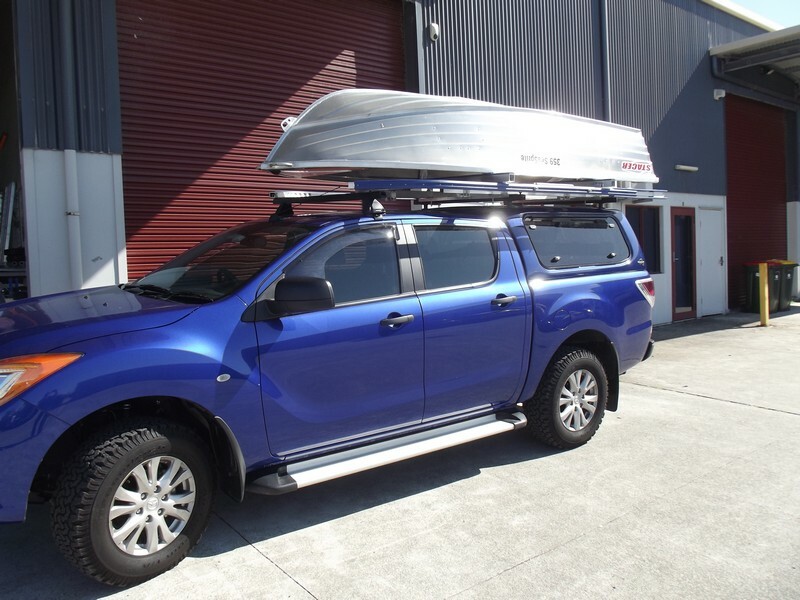 You need to make sure that the roof racks are supported through the canopy roof and down to the tub of the ute. The roof racks need to be at the front and rear of the canopy, at least 1200mm apart and not halfway along the canopy. Most roof racks on canopy’s with internal bar supports are rated to 120kg – 150kg for 2 racks. Can the boat loader be fitted to the cab roof of my dual cab ute? Yes. The boat will travel on the cab with not problems but keep the boat size under 3.5m. The roof racks must be track mounted or bolted into a pre- engineered mounting point and at least 1200mm apart. DO NOT use roof racks that clamp under the door jam as these can pop off during travel. We recommend that the boat be carried on the canopy not the cab of the dual cab ute. Can I mount the SideWinder onto my cab and canopy? This is not a good idea. Most dual cab utes are built so that the cab flexes separately to the tray back. This flex can be up to 50mm and can result in one of your roof racks been torn off the roof. Boat loaders should be mounted either on the vehicle cab or on the canopy (preferred) but not on both. NOTE: BoatHoist have now developed a customized FLEX-MOUNT that overcomes this problem and can be used with steel canopy’s like the Razerback that have the 2 roof racks about 900mm apart at the rear of the canopy. I have an existing cargo rack on my car, can the SideWinder be fitted to this rack? A lot of customers have a luggage rack that they want to use so BoatHoist have designed what we call the UNI-MOUNT that clamps to the top rail of your rack. You need to make sure the top rail of your rack can carry the weight of your tinnie so a fully welded racks best. Some luggage racks like the Rhino Rack AT Roof Tray are NOT suitable for the uni-mount system. What size boat will the SideWinder handle? The SideWinder is rated to load up to 100kg and will suit a boat up to 3.95m in length and 1.6m wide. If your boat is wider that this we can customize our cross bars to suit. Boats that are bigger than these sizes are not suitable as a cartopper and we would not recommend our boat loader. What type of boat will the SideWinder suit? As long as your boat does not exceed the sizes above any of the aluminum boats on the market will work. We have even loaded plastic Finn boats, Tuff Tenders and Cross Country composite boats. The SideWinder DOES NOT suit inflatable boats. Do I need tie down straps? No. We supply 4 clamp plates that locate into the gunnel of your boat and bolt through the cross arms of the boat loader similar to how shipping containers are locked to the bed of a truck. With this system the boat CAN’T MOVE, even after a 1000 km of the roughest dirt roads. You don’t even need to tie the front of the boat down to the bull bar. What type of winch do you use? We use a 1.3 tonne capacity 12volt electric winch fitted with synthetic rope, hand held remote and a backup hardwired hand switch. The winch is fitted with an Anderson plug and will draw about 35 amps at full load. The winch WILL NOT drain your battery. We have one deep cycle battery in our Prado and will load and unload our boat 30 times a day at a show and the car still starts at the end of the day. How much does the SideWinder weigh? The BoatHoist SideWinder is all aluminum with removable electric winch and side arms. The fixed frame on the vehicle weighs under 20kg and with the side arms fitted about 30kg. Is the boat loader easy to remove from my car when not in use? Yes. Just undo the clamp plates that hold the SideWinder to the roof racks and slide the frame off. Takes about 5 minutes. How high does the boat loader sit above my roof rack? The SideWinder sits 100mm above the top of your roof rack. Is the SideWinder easy to fit? Yes. The system has been designed to be easily fitted by the average home handyman, no engineering degree required. All the parts just sit in place on your roof rack and all you need to do is tighten the bolts. The SideWinder comes with 2 page fitting instructions and we have an online fitting video as well. Full assembly will take about 3 hours. NOTE: You DO NOT need to drill any holes in your boat to fit the winch point. If I change my vehicle can I re-fit the Boat Loader to my new vehicle? Yes. The SideWinder is designed so the boat loader can be easily moved from one vehicle to the next with no problem. However you do need to have the same fitting kit. 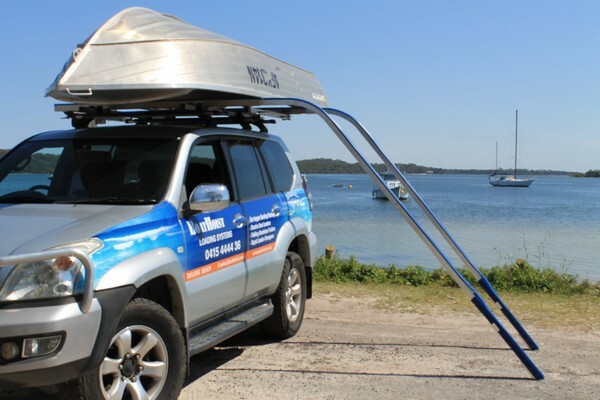 A roof rack mounted boat loader can be swapped to another roof rack, a cargo rack with uni-mounts can be swapped to another cargo rack etc, but you cannot swap from a roof rack mount to a cargo rack or vice versa. Please call to discuss if you plan to change your mounting set up on your new vehicle. What Makes the SideWinder so good? The KIS principal. Keep It Simple. The only moving part is the electric winch and that is removable. All other parts of the boat loader are securely bolted so nothing can rattle or come loose. There are no plastic connections, springs, hinges or other moving parts that can cause problems in the future. What type of warranty comes with the Boat Loader? The BoatHoist SideWinder comes with a 3 year structural warranty on all aluminum parts, and a 1 year warranty on the electric winch. We have sold 100’s of SideWinders over the past 6 years and we just don’t have any problems with them.